Love or hate Destiny 2, you can't deny that the game just feels really great to play on a controller. But now that it's coming to PC, players have been curious how the game would play on mouse and keyboard. Thankfully, we now have an idea, via Bungie's weekly blog post. 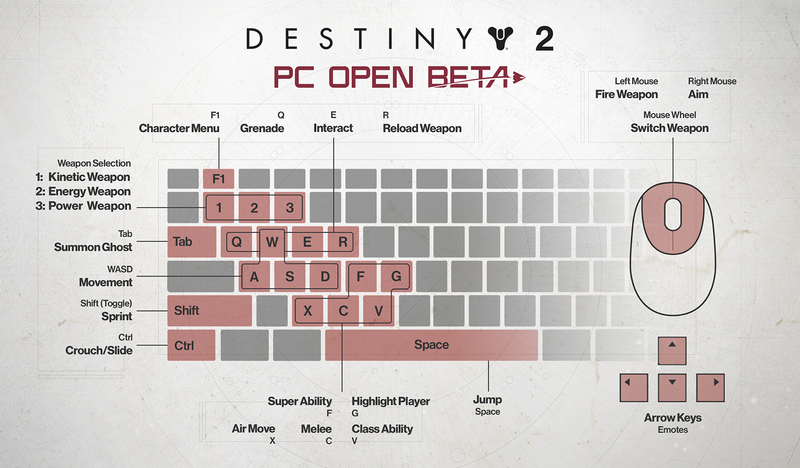 With the PC beta looming just a few days away, the developer has revealed the default keybindings for the game. The controls are pretty standard for a shooter, but they are entirely customizable, meaning any function can be mapped to any button on a mouse or keyboard. Bungie also confirmed that the PC beta would be the testing point for Destiny's first ever text chat experience. Using text chat, you will be able to type to other players in your Fireteam (/f), whisper friends (/w), and cycle through different visual modes. Eventually, Bungie plans to add support for a team channel and the ability to whisper clan members. With Destiny 2 being the series' first foray onto the new platform, it's comforting to know that the game will come with all the bells and whistles that PC gamers have become accustomed to. The Destiny 2 beta begins on PC next week, and the PC version launches on Oct. 24.